Maruti has started the 5 year/1,00,000 kms warranty as well. I have been charged Rs. 12,390 for the same, this is for ZXi+, for other variants, the prices may vary. Warranty is known as Extended Warranty Royal Platinum and is valid till -04-2023 or 1L kms. This is the new ride which will complement my Scorpio 4WD. 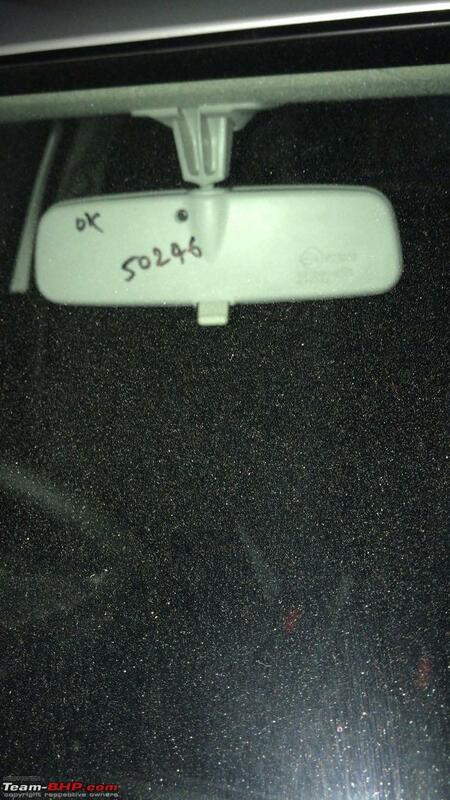 And this ugly handwritten code or whatever in a brand new car. I am going to take these with Maruti and going to see that choosing a Maruti over competitors was a wise decision or not, especially as far as after sales go. I will keep you guys posted. Last edited by Sheel : 19th April 2018 at 22:48. Great review, I was eagerly waiting for this, and can easily say, the most anticipated review of the next generation Swift for any car enthusiast. Thank you Aditya and Moralfibre. Also, wanted to clarify if the older Swift really had a 42 liter diesel tank. Even though the fuel tank is 42 liters in size, thanks to the diesel's fuel efficiency, you can realistically expect a tank range of 600+ kms (city) and 750+ kms (highway). Ride: The suspension of the swift is definitely tuned for handling and ride is a compromise. However, I drove the car for a brief period of time in the city speeds with 4 people on board. There was a significant difference in the ride of the car. Just a doubt, is the weight of the car not sufficient to actuate the suspension? The suspension is tuned on the firmer side; helps its handling and also the ground clearance (as it doesn't sag as easily). Steering does not feel direct and does not offer enough feedback. The steering isn't the best on feedback, but its still direct and the car's nose is obedient. It's a lot of fun to drive. I am not very happy with few things, first the infotainment. The infotainment refuses to play music via bluetooth from an iPhone, if not for BHPians, I would have believed the technician that, music cannot be played via bluettoth on an iPhone [w/o car play]. Strange. Never encountered this with the Brezza, Ciaz or S-Cross. As rightly pointed out by AShubrah, it could be a software update issue. Please keep up updated on this. Do note down the version numbers before and after so that we can verify that what version supports this feature. This is done by the dealer to identify the car parked in the yard. I'm guessing it is the chassis number. Generally, most dealers keep a ticket in the dash or stick it on the driver visor and flip it down so as to quickly identify the car amongst 100s of others. I was wondering where they are selling the new Swift. I spotted hardly 3-4 new Swift in Bangalore till today. I visited my home town in Kerala for 10 days, and how many new Swift I spotted during these days? Easily more than 50!. Brand 'Swift' is so strong even though there are better cars available in the market. Last edited by Latheesh : 20th April 2018 at 10:19. Thank you. Added to the review. In 5th gear, when doing 100 km/h and 120 km/h, the engine is ticking over at ~2,150 rpm and 2,650 rpm respectively. On the expressway, you will not find the need to downshift while overtaking. It's only when you are on an undivided highway and the speed and rpms drop considerably, that you will downshift to pass the vehicle ahead. In general, you always get the feeling that the 1.3L oil-burner has adequate power and torque to keep the average Joe happy, yet enthusiastic drivers are likely to look elsewhere (read = Figo & Polo GT TDI). Good to know the gearing has become tall. In my 2008 Swift Diesel, 100 comes up at 2400rpm and 120 at 2900 rpm, in this version with the taller gearing it will be a better cruiser than the older versions of the Swift, now all Maruti has to do is give a bigger diesel engine aka the 1.5 diesel and a 6 speed gearbox and we are at par with the competition and even better than them maybe. If one has to pick petrol Automatic, which is better Ignis or Swift ? Excellent and a very comprehensive review, which has only served to put my mind at rest as I am awaiting a Petrol MT Swift ZXi to be delivered next week. I wrote an e-mail to MUL stating the facts. Received a call by 11:30. I visited the dealership and they cleaned the IRVM. Not that I didn't try cleaning it. As far as the second issue goes, they were again giving lame excuses ; technician is away / on a TD / some personal issue / lunch time and they wanted me to sign the satisfactory note as well. I left the dealership after wasting close to 90 minutes and on my way back I received an acknowledgement e-mail. I replied stating the facts. Have just received a call/e-mail that they will come over and attend at my place. Through Team-BHP, I would like to appeal to MUL that they ask that particular dealership to use some other method to distinguish the car's key/VIN rather than writing it on the IRVM. Last edited by Sheel : 20th April 2018 at 19:12. Great review as expected. Rated a well deserved 5 stars. I didn't notice it until I clicked the link to see why there are so many posts in a Swift thread. now all Maruti has to do is give a bigger diesel engine aka the 1.5 diesel and a 6 speed gearbox and we are at par with the competition and even better than them maybe. That will always remain an unfulfilled dream. Maruti will never launch a product that touches the heart. The only products they launch here are the ones that meet the profit and sales targets. If Suzuki wanted, the option of owning a genuine fun to drive Suzuki would have been available the day they set up manufacturing facility in India. Baleno RS, Ciaz RS (if they can be called so) variants, and putting the plug on S-Cross DDiS 320 are very good examples. They don't even consider having such cars as halo products, but we can always hope for the best. A very well compiled review. . Rated 5 stars. The New Swift 2018 looks smashing especially on the performance front where its Lower body weight gives it a higher Power and Torque to Weight ratio as compared to its Predecessor. This also makes it more frugal what with an ARAI rating of 22KMPL as pointed out in the review. So, Maruti has a winner on its hand all over again in the B2 Segment of Hatchbacks. Just few grouses though. The retractable cup holder and the slat for keeping tiny knick-knacks near the front co-passenger should have been persisted with as in 2nd Gen Swift. They were really helpful especially the slat like recess below the dashboard which could take care of mobile/minor things of missus. Absence of engine temperature gauge is unpardonable. Even Hyundai which had resorted to such glaring omissions in earlier models of i10 were forced to bring it back in their recent launches. Agreed, there is an indicator which is blue on cold start and changes color to red when motor overheats but still, a proper engine temperature gauge is a must IMHO. Thanks, Aditya and Moralfiber for an excellent detailed review. 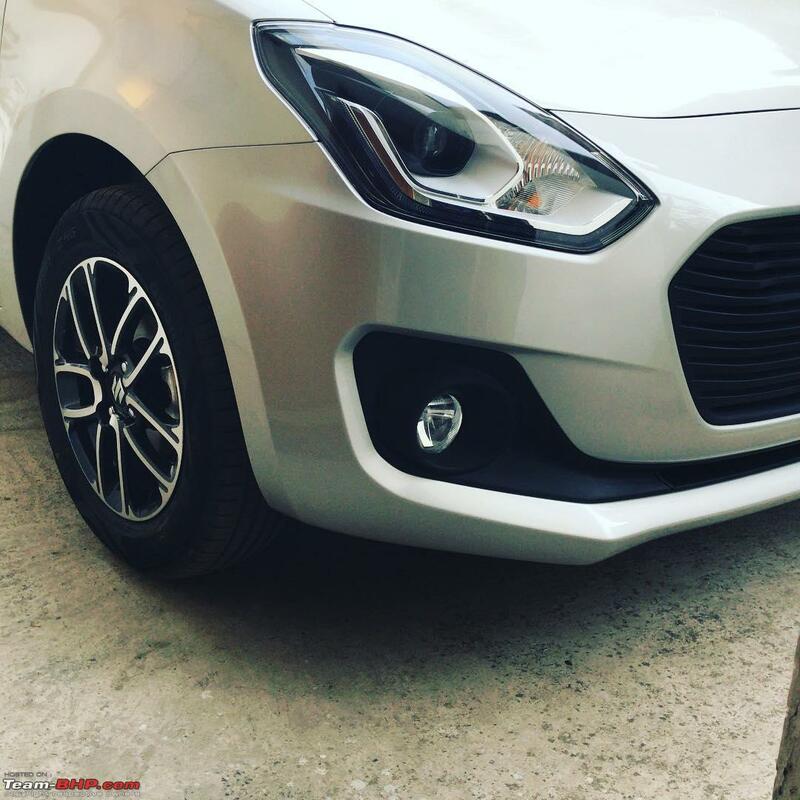 I think Swift 2018 better than MS Dzire in all the aspects(except rear leg room). 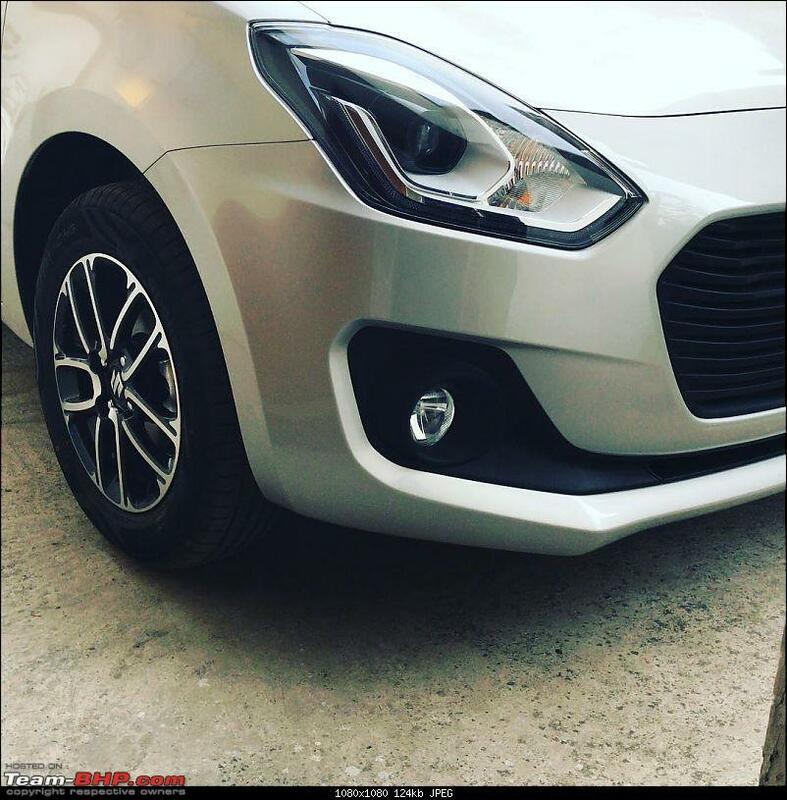 MS has done a good job of differentiating the Swift from the Dzire. Chevy beat kind of rear door handle, makes it look like a three-door car. IMHO, Swift 2018 is a VFM proposition in under 8Lakh hatch segment. Excellent review. Is it just my head that feels that the New Swift Seats are thinner than before. The thick seats of the old version of the car were excellent. These appear thinner to my eye. Well fed people will larger frame would appreciate how nicer the thick seats are. The manufacturers scooping out seats for every inch of leg room is not a very good thing to do. Even the Honda Amaze should have had the Jazz like seats in my opinion.